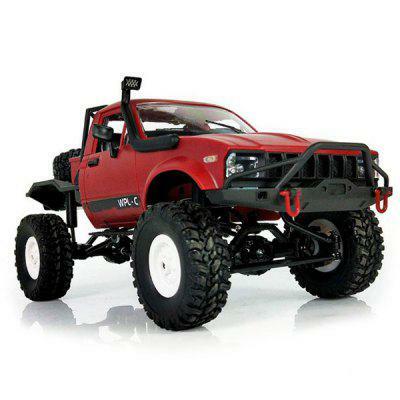 If you weren’t already satisfied with the current selection of R/C crawler kits, Hobbytech has introduced the second version of their CRX trail rig. Appropriately named, the CRX Survival V2 is a 1/10-scale rig which sports a 324mm base wheelbase, a 4×4 drivetrain and a rugged-looking body that’s begging to be customized. Highlights of the CRX Survival V2 kit include all-metal gearing, aluminum-bodied shocks (adjustable), locked front and rear differentials, a two-speed transmission with remote shifting (servo included), ball bearings throughout, and 1.9″ tires. In addition to these chassis features, there are a number of scale body details included with the CRX Survival V2, including front and rear bumpers, door handles, side mirrors, gas cans, and a smokestack-style exhaust tower. Looking at the studio and action photos that Hobbytech has released, there doesn’t appear to be anything out of the ordinary with this rig. That said, it appears to be a solid option for those looking to build a radio-controlled crawler that isn’t quite mainstream. No price has been released for this model, so be sure to check hobbytech-rc.com and the Hobbyrech RC Facebook page for additional details about this model.